Abstract: A new collection of nine CNS active compounds, which have been recently licensed, is now available in the BIONET collection. This screening collection with experimentally-determined bioactivity, lipophilicity (LogP/D7.4), aqueous solubility, GIT and BBB permeability, chemical stability and toxicity will address the need of new, robust, and multipotent small molecules for the treatment and diagnosis of CNS diseases, such as Parkinson´s disease, Alzheimer´s disease, dementia and/or other neurodegenerative diseases [1–3]. NMR and LC-MS analysis allowed the careful control of the compound quality. Importantly, the newly discovered and well-validated molecules are enriched in heterocyclic scaffolds and specifically substituted phenyl moieties commonly found in CNS drug candidates, and spans chemical space that minimally overlaps with existing commercial collections. In addition, the compounds are easily accessible and offer the possibility of broad structural diversities in order to further explore the chemical space within further biological screening on relevant CNS targets . 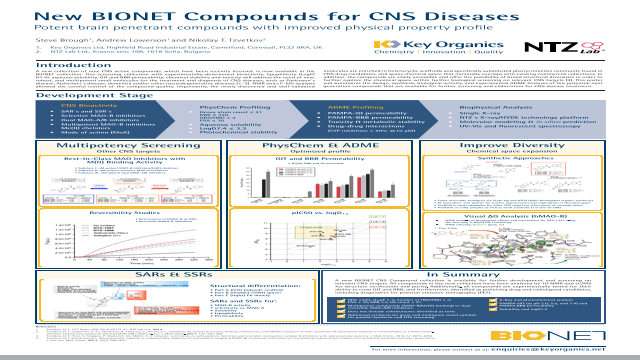 This poster will summarize the design, synthesis, biological activity, and experimental ADME features of this potential next generation compounds that are available for further screening and elaboration for CNS disease treatment.Summary: A new BIONET CNS Compound collection is available for further development and screening on relevant CNS targets. All compounds in the new collection have been analyzed by 1H NMR and LC/MS for structure verification and purity. Additionally, all compounds are experimentally tested for their ability to cross GIT and BBB, and furthermore, identified as promising drug and radioligand candidates, including diagnostics for positron emission tomography (PET).References: 1. Tzvetkov, N. T. PCT Patent WO 2014/107771 A1, NTZ Lab Ltd., 2014.
selective monoamine oxidase B and dual MAO-A/B inhibitors. Eur. J. Med. Chem., 2017, 127, 470–492. 3. Tzvetkov, N. T.; Hinz, S.; Küppers, P.; Gastreich, M.; Müller, C. E. Indazole- and indole-5-carboxamides: Selective and reversible monoamine oxidase B inhibitors with subnanomolar potency. J. Med. Chem., 2014, 57, 6679–6703. 4. Tzvetkov, N. T. and Antonov, L. Subnanomolar indazole-5-carboxamides inhibitors of monoamine oxidase B (MAO-B) continued: indications of iron binding, experimental evidence for optimized solubility and brain penetration.